I'm pretty happy with this painting. It's a 15x19 inch watercolor on 140 lb Strathmore cold pressed paper. It's mostly a happy accident because the process was not exactly as planned. The paint mixing chart from the January 2nd blog entry was used as a reference to pick Cotman's lemon yellow and intense blue. I used a dab of Cotman's cobalt blue here and there as well for variety. I'm very satisfied with the color of the painting so having the yellow and blue mixing chart was very useful. I should keep making these kind of charts for other combinations that may be used down the road. My intention was to put down a big yellow area and then cover part of that area with wet blue and then lift vertical lines of that blue with a dry brush. The paint wasn't lifting very well. Maybe because the 140 lb Strathmore cold pressed paper has more texture and tooth than the smooth 5x7 inch sketch pad paper where i've tried with better success the lifting technique? More water was applied to try and unlock the stain in vertical lines, but this merely softened the line between where paint was and where it wasn't supposed to be. I wanted a more distinct border. So the whole painting was looking quite "soft" and i was disappointed. Then the "old crutch" cellophane wrap was laid on top of the wet mixture and wrinkles were purposefully made vertical. When that was dry, the painting was complete as it is now. There was a bit of buckling in the paper and the paint pooled at the bottom of these waves. The wrap didn't touch the whole length of the paper because of the buckling. So if i try this one again, i'll make sure to stretch the paper using meat cutting tape to avoid the buckling. 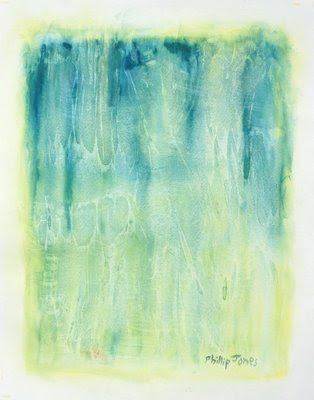 I may also try it again using hot pressed or smooth paper to see if the wet paint lifts more readily with a dry brush.